RICHMOND, California – The City of Richmond continues its leadership in working towards health equity with the release of its first Health in All Policies (HiAP) Report. Health in All Policies , or “healthy public policy,” is based on the idea that health starts with where people live, work, learn, and play, and that community health is influenced by more than individual choices. One’s physical and social environments, along with local government decisions and actions that shape these environments, have an impact on health outcomes. The HiAP Report is a recap of the influence and progress of Richmond’s Health in All Policies ordinance and strategy and identifies how it will continue to grow over the next decade (R.M.C 9.15). It also tells three narratives of how the many efforts in Richmond – of the City, residents and organizations – are combining to impact core health concerns of residents. 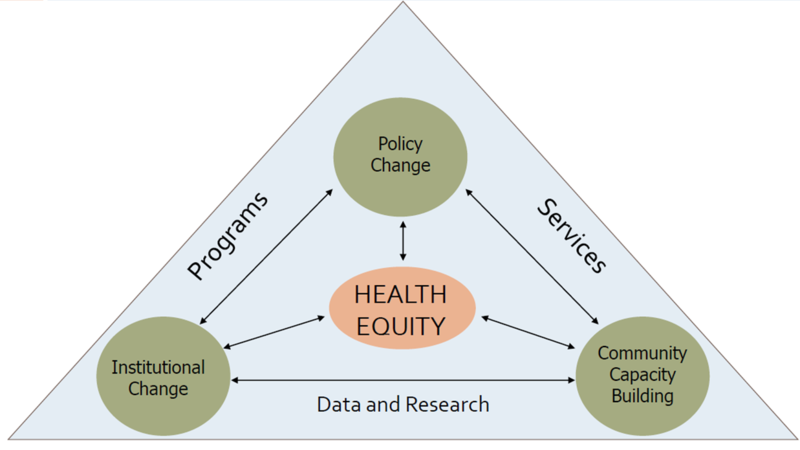 After a community development process that began in 2012, the first step for the City of Richmond in this process was to begin speaking the language of health equity and to understand the suite of City services, programs, data collection and policy development that could be coordinated to promote health equity. Richmond Adopts a Health in All Policies (HiAP) Strategy and Ordinance! The City of Richmond continues its leadership in working towards health equity exemplified by the recent adoption of a Health in All Polices (HiAP) strategy and ordinance by the Richmond City Council. The HiAP strategy sets a framework of collaboration within city departments as well as with community based organizations and other government agencies to address community health, equity and sustainability in Richmond. Through this lens, Health in All Policies is both a practice and destination. Health in All Policies or “healthy public policy” is based on the idea that health starts with where people live, work, learn, and play and that individual and community health is influenced by more than just individual choices. One’s physical and psychosocial environment, culture, government, etc. all play a role in influencing and determining both individual and population health. Health in All Policies (HiAP) is the integrated and comprehensive approach to bring health, well-being, and equity considerations into the development and implementation of policies, programs, and services of traditionally non-health related government systems or agencies. The HiAP concept recognizes that the causes of health disparities and the resulting health inequities are the consequence of a variety of social factors that include income inequality, economic forces, education quality, environmental conditions, individual health behavior choice, and access to health care. Health disparities are not fair, nor are they inevitable. This concept acknowledges that all city departments impact health, even those we do not traditionally consider as conducting health-related work. Richmond’s Health in All Policies Strategy is being developed as a collaborative approach with the goal of improving health equity by addressing the social determinants of health and integrating health into the decision making process across all departments of the City. A driving theory behind the HiAP Strategy is that the cumulative impact on the body of multiple stressors is a key driver that explains the persistence of poor health outcomes disproportionately afflicting people of color in Richmond. Thus, Richmond’s HiAP Strategy may take a multidimensional and integrated approach to reducing the cumulative stressors that occur from an early age and throughout life in the most vulnerable Richmond neighborhoods. By focusing on cumulative stressors, we hope to reduce the occurrence of many chronic illnesses and premature mortality for Richmond residents who are currently experiencing health disparities. All resources related to the RHEP HiAP Subcommittee and community engagement resources can be found at the Richmond Health Equity Partnership Resource page.